In a response to my previous post “Geography of High-Quality Science” Rasmus Persson has raised an interesting question: to what extent does or does not national GDP correlate with the “research output”? Here I try to answer it and analyze trends. To plot GDP values vs respective weighted fractional counts (WFCs) for each country covered by Nature Index, I have taken the same WFCs as in my previous post and GDP estimates derived from purchasing power parity (PPP) calculations as listed in the CIA World Factbook (in billions of international dollars, data retrieved from the Wikipedia article, the GDP for Vatican is derived from National Geographic page). Keep in mind that GDP values are different in different sources, but the general trends must be similar. All these values together with countries ranking in GDP and WFC are given in the table below. I also list some countries from the CIA World Factbook that do not appear in Nature Index at all. Those countries that do not appear in the Nature Index have very small economies (GDP below $130 billion dollars) and generally are so poor or war-torn that they cannot provide stable conditions for expensive high-quality research. Nevertheless, there are many countries with small economies that produce considerable amount of good publications, via providing stable conditions, financial support, collaborations with other countries and due to scientific tradition. When GDP is plotted versus WFC, the correlation is far from being ideally linear (R2 = 0.81), but the general trend is observed: the bigger economy, the bigger research output. Those countries that are far below the trend line are likely to invest larger part of their GDP for the research & development to be more competitive in the future. For instance, the United States expenditure was 2.79% of GDP, while for instance China’s investment was 1.98% in 2012 (the World Bank data). Nevertheless, China has realized long ago the important of R&D and it drastically increased its expenditure for R&D by 0.22% of GDP only in two years (from 2010 to 2012). More striking outliers are India and Switzerland. India has economy 13 times bigger than Swiss economy, it has very low expenditure for R&D (around 0.8%), not to mention the difference in population. Remarkably, Swiss WFC is larger than Indian (1241.6 vs 951.8). Thus Switzerland has very large positive difference between rankings in GDP and WFC (+27), while India—negative (−10). Other important reason is that despite the big economy, GDP (PPP) per capita in India is pretty low: it is only Int$4000 in contrast to Int$54800 in Switzerland, and India is bound to improve in the first place well-being of citizens rather than investing more into R&D. In order to look at this question more closely, GDP (PPP) per capita (retrieved from this Wikipedia article, the GDP per capita for Vatican is taken from National Geographic page) is plotted versus WFC per capita (WFCpm, see my previous post for definition). All data are given in the table below. 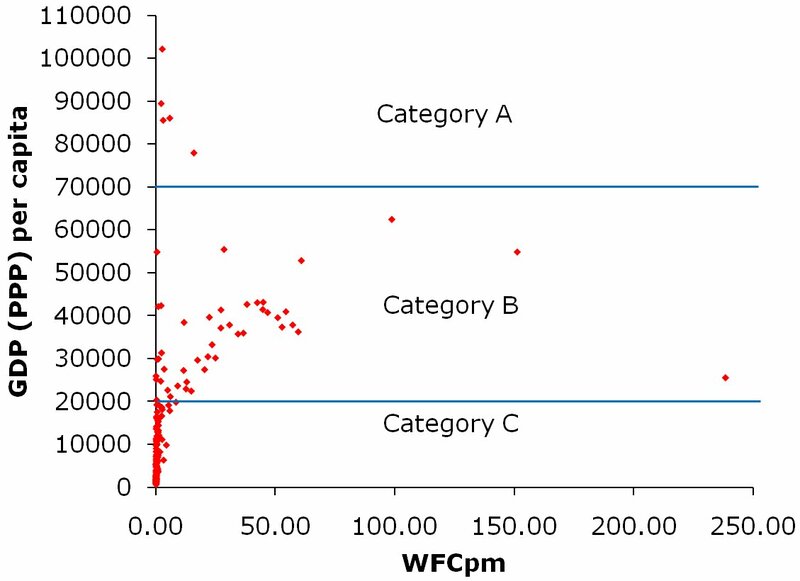 In the scatter plot of GDP per capita vs WFCpm no such clear trend is observed as in the plot of GDP vs WFC. This is due to the fact that countries total research output depend directly on the expenditure from the total GDP, while wellness of country’s citizens do not directly affects research output “per capita”. Nevertheless, it is obvious from the plot that countries, where standard of living is relatively low, the majority of population also lacks means and motivation to take part in the research in this country. This boundary somewhat arbitrary may be drawn near $20000 per capita per year. Countries with GDP per capita below this line fall into Category C. These countries have WFCpm below 9. It does not mean that those countries have low total GDP or low total WFC. For instance China is the second in the world in both total GDP and WFC. On the other hand, Russia that also falls in Category C is sixth in the world by GDP, but 19th by WFC. This is due to the fact that Russia is rich in natural resources, but it fails to use this advantage to invest more money in R&D (1.12% of GDP in 2012) and to improve the standard of living of its own citizens. Such countries often depend only on something that nature provides, but have not really sustainable economies. Another extreme is very rich countries with GDP per capita over $70000 (Category A). There only five such countries with very small population. These countries have generally their incomes from sources other than R&D: for instance Qatar has huge oil and gas reserves, Monaco is tax haven. Thus, they have quite small WFCpm below 5, with a remarkable exception of Luxembourg that has also developed R&D and WFC over 15. The backbone of the world’s R&D is mostly formed by the countries from the Category B that have reasonably high standard of living (GDP per capita $20000–70000) and thus have capacities to invest in R&D without sacrificing wellness of their citizens. 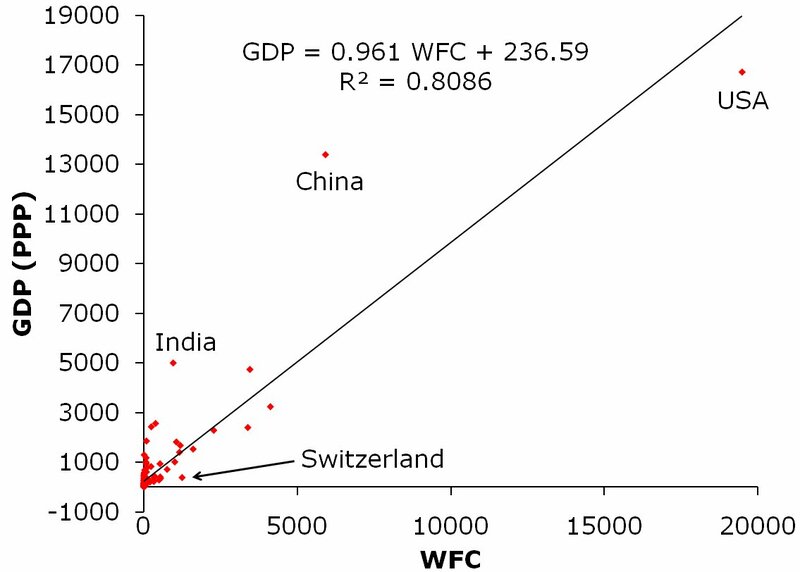 Here the extremely large range of WFCpm is observed: from 238 in Vatican (see my previous post about that phenomenon) and to 0 in Seychelles for comparable GDP per capita around $25000. One may argue that high standard of living in countries with relatively large population and low WFC values depend on the natural resources rather than on their technology advances and if they do not start to invest in R&D their standard of living will deteriorate as the natural resources deplete. Understanding of this issue plausibly was among the reasons for Saudi Arabia to use their natural resources for building amazing KAUST. On the other hand, those that invest in R&D and have high WFC ensure their high standard of living by technology advances and depend less on their own deposits of natural resources. Examples are Japan and South Korea. In summary, development of national R&D and economy is interdependent. The bigger economy has more capacity for supporting expensive research, but advantages in science and technologies also improve economy. Poorer, less technologically developed countries are in vicious circle: they are too poor to really increase their expenditures for science, but their technological development is too low to increase their competitiveness in the world market. These countries require measures similar to those done during the rise of the Asian Tigers or need a help from other countries through programs similar to Marshall Plan. As Nature Index is published for the rolling 12-month window under a Creative Commons Attribution-NonCommercial-ShareAlike 4.0 International License (CC BY-NC-SA 4.0), this analysis can be used under the same conditions. Seeing as this post was made in response to a comment by me, I think I should contribute with my view of things :). First, I obviously do not think that there is not a positive correlation between GDP and research output. Obviously, research costs money and so a short supply of it means that there cannot be as much research done. I am interested in to what extent does new research (especially the kind of research indexed by the Nature index) contribute to a countries economic development? Let’s look at your last graph, for instance, where you have plotted the GDP per head vs the WFCpm. Assuming for the sake of argument that the GDP per head is at least partly the effect *caused* by the WFCpm (i. e. “Nature Index” research breeds economic development), I discern a clear maximum at around 100 WFCpm. An indication, to me, that more research is not always necessarily better. There is an optimum level. In the same vein, looking at your first graph, I would say that China and India are the big “winners” (they lie far above the trend line), in that they get a higher GDP out of less research, whereas America is a loser (it lies below the trend line): Americans do not get as large a return on investment on their research in terms of GDP. I think it is not enough to be just satisfied with current GDP vs WFC ratio, as the US may have at the moment less return from investment in R&D, but it will pay off in the future. When you just have a “perfect” balance for the moment, “competitor” countries may over-invest in their R&D at the moment and get less GDP and GDP per capita, but this competitor is likely to have later larger market than you and even take part of your market. That’s why China increase its research funding much faster than many other countries. Some countries may over-invest in R&D, but it is still better investment than disproportionally high investment in military, for instance. Anyway, as we have seen from the post, GDP depend not just from R&D and many other factors play important role, so it is speculative to say that China gets more from less. I agree with you that it is likely that after some WFCpm value, the standard of living does not really improve. One must also keep in mind that the current GDP is a result of *past* and not current R&D achievements and WFC, so GDP is kind of delayed. Thus more important analyzes would be compare dynamics of GDP vs WFC over years and see how they correlate over time.